Standing in the Rio Grande riverbed just south of Downtown Albuquerque. For reference, the treeline is where the riverbank would usually be, and all of the dirt pictured is often covered by water. PASKUS: We’re just south of Downtown Albuquerque in the South Valley. The river right here is maybe 50 feet wide—50 to 70 feet wide—and, I mean, it’s just inches deep. It’s not a raging torrent. It’s flat and pretty slow. And we’re standing kind of in this low floodplain that probably should be covered with water, but has some vegetation growing up. And so right now I think the flows we’re seeing are not really native Rio Grande flows. This is water that comes from the San Juan River system, so it’s definitely water that’s being supplemented through engineering and management. 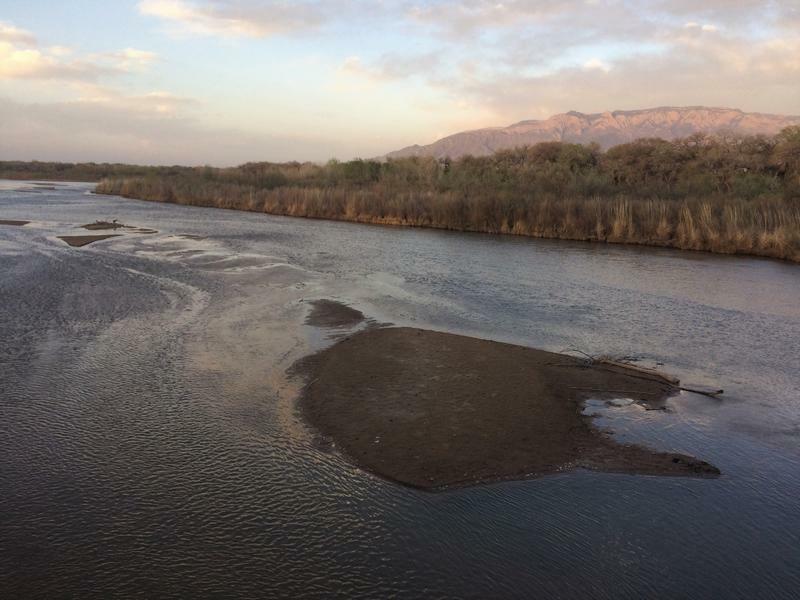 KUNM: There are parts of the Rio Grande that are completely dry now, right, in the state? PASKUS: That’s right. There’s about 22 miles dry south of Socorro, like through San Antonio and into the Bosque Del Apache refuge. And then there’s about 4 or 5 miles dry in the Isleta Reach right now. KUNM: Is this something that happens normally? Or is this an unusual situation? PASKUS: So people say that historically stretches of the Rio Grande have dried. But what we’re seeing this year—and what we’ve been seeing over the past 18 or 20 years—is unusual, because we’re in a climatic period where human-caused warming is affecting the region. We’re getting drier, we’re having less snowpack, so we don’t have those nice Spring flows. 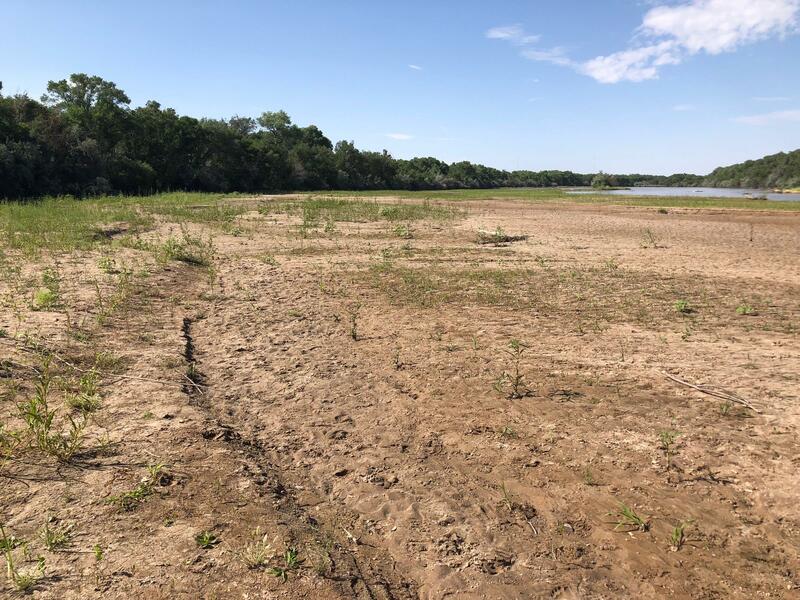 But agencies are working together to try to prolong flows for as long as possible, but they are anticipating that the Albuquerque stretch could dry this summer, and it would be the first time that’s really happened in a very long time. KUNM: We are talking about the effect that global climate change is having regionally. But is this just an issue of climate change? Or are there decisions that are being made here in New Mexico that are changing this river right now? PASKUS: We made a lot of choices and decisions throughout the 20th Century to manage our rivers, to build big reservoirs, to encourage large-scale farming. I think we have the knowledge, and we have the technology certainly, but we don’t have the policy, the legal structures, and definitely the political will to make sure that as the region warms and dries, that rivers are protected and that communities are protected. KUNM: And as we go through political cycles, I just wonder if there’s anywhere near the kind of attention that there needs to be—given the magnitude of rivers and what they mean to our communities—on things like asking politicians where they stand on river management. 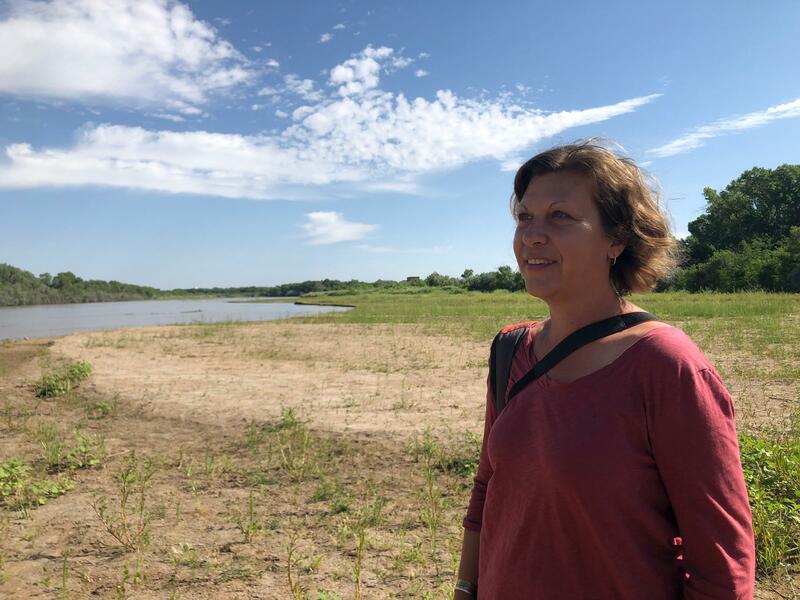 PASKUS: Yeah, and as much as I hate this year—it was a heartbreaker, especially, to see the low flows in the spring when the river should have been rising—I think that this year provides an opportunity that people should grab onto right today at this instant. 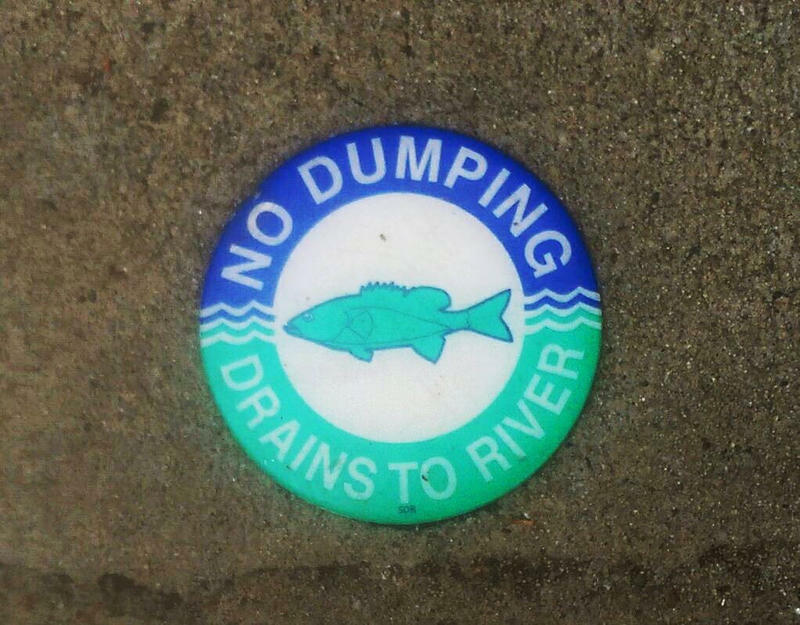 Go to your local rivers. Come to the Rio Grande. Go to the Pecos. Go to the San Juan River. See the rivers in your community and see what they’ve been suffering at our hand. We all need to be better advocates for our rivers because none of our communities would be here in the first place if these rivers hadn’t been here. And it’s pretty shortsighted, and frankly sort of ridiculous, that we’re not thinking about the long-term future of the rivers and our state. If you look around the state right now, you know the Rio Grande where we’re standing is low and is dry South of us. But the Pecos is dry in stretches. The Pecos River is really low. The San Juan River in Farmington is about 1,000 CFS [cubic feet per second]. This time of year it should be closer to 2,000. The Gila River—I checked the gauges this morning­—is at 15 CFS. The Animas River is dry. La Plata’s Dry. We should have been taking this more seriously 20 years ago, but we should do it right now. 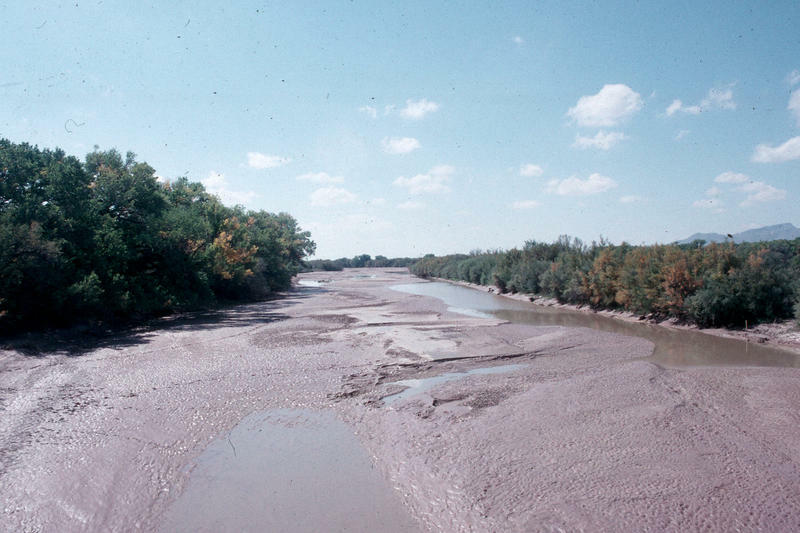 A dry Rio Grande in springtime isn't normal. But it will be. Pollution flowing out of Albuquerque in the Rio Grande is a problem for Isleta Pueblo and other downstream communities. Now the city is boosting oversight of water contaminants.